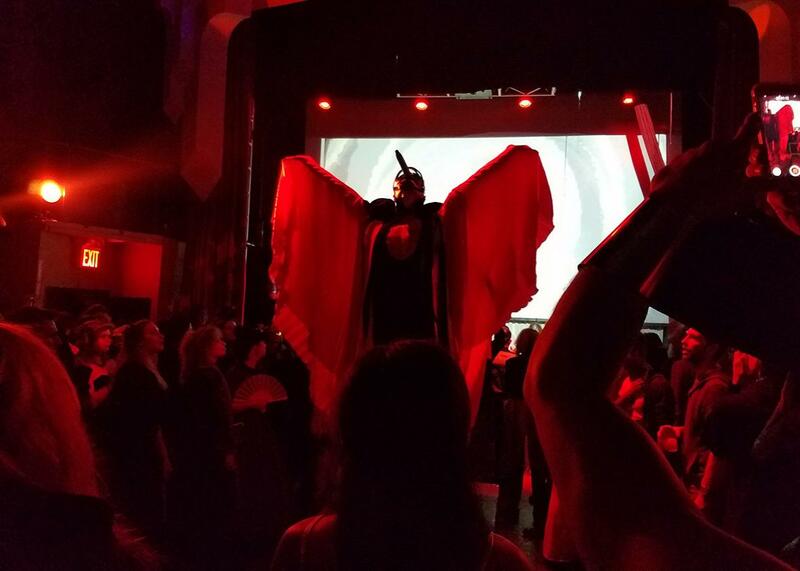 A night at Witches Against Fascist Totalitarianism’s anti-Trump fundraiser party. Calling the corners at WAFT’s Crystal Ball. Donald Trump’s approval ratings recently hit a record low. Among young people, college graduates, nonwhite people, and women, the disapproval ratings are especially high. Here’s one more constituency to add to that list: witches. The Trump administration has awakened all sorts of people’s political consciousnesses. It’s only natural that witches would be among them, and more and more, they’re gaining attention for their actions. Witches were in the news a few weeks ago when a Facebook post calling for a mass Trump binding ritual went viral. And on Sunday night, a new group called Witches Against Fascist Totalitarianism threw its first event in New York. WAFT supporters donned crushed-velvet cloaks and false eyelashes for WAFT’s Crystal Ball at the House of Yes, a nightlife venue in the Bushwick area of Brooklyn. As a representative from the Lady Parts Justice League, a reproductive rights organization, circulated around the party, administering metallic ovary temporary tattoos (which I spotted on necks, foreheads, and décolletage), another volunteer held a sage smudge stick and walked around offering partygoers impromptu cleansings. Gays Against Guns was also on hand, witchy jewelry was being sold, and drinks were being poured. When she’s not fighting totalitarianism through witchcraft, WAFT organizer Ana Matronic sings in the group the Scissor Sisters. On Sunday night, she wore a mod wig and a dress covered in white tulle. She said the idea for WAFT was born earlier this year in “a minivan on the way back from D.C. from the Women’s March.” She explained, “we are a group of alternative spiritual practitioners, and we are extremely concerned about the fascist spirit.” She added, “we already got together on a regular basis and dressed up as wizards and had a good time, and so I thought we should get together with a little bit bigger of an idea.” The evening’s proceeds would go to Population Action International. At the witching hour, there was a plan to call the corners, but the performance portion of the evening began with an aerialist and a singer. WAFT turned out to make a handy chant for some Paris Is Burning–style voguing on stage: “waft with me, waft with me,” speakers blared. Attendees seemed to be a mix of practicing witches; “witches at heart,” as one guest called herself; people who like to dress up; and people who oppose totalitarianism (with some understandable overlap among those categories). Talk about a rainbow coalition. Meanwhile, Anna Cole, who was wearing a Victorian dress and had come to the party with friends, explained that while she isn’t a witch, “I think the witchcraft thing does resonate with us because we’re both really into feminist issues, and we were talking on the way over here about how some of the more patriarchal religions are not exactly friendly to women.” She said she has spent much of the first few months of the Trump administration at protests. Midnight came and went (it really wouldn’t be anti-fascist to keep to a strict schedule), but around 1 in morning, it was finally time to call the corners, or cast a circle, as it’s also known. As Peter Mercury had explained to me earlier, this means defining the space that will be used to cast a spell or host a ritual: “It becomes a liminal space between this world and the next. You are creating the sacred space.” To do that, you call in the four elementals, which are associated with the four cardinal directions. This party really was turning out to be a very educational experience.